A mollusk is the second largest phylum of invertebrate animals. As an invertebrate, a mollusk is a large phylum which includes snails, slugs, mussels, and octopuses. They have a soft unsegmented body and live in aquatic or damp habitats, and most kinds have an external calcareous shell. The mollusk that is called a gumboot chiton, scrapes algae off ocean rocks using a specialized set of teeth made from the magnetic mineral magnetite (Fe3O4). Now for an invertebrate, it is difficult to visualize how these animals eat, and it is reported they have teeth that have a maximum hardness and stiffness of any known biomineral called limpet teeth. It is reported that the structure of these teeth are so strong, engineers and scientists are working hard to understand the biological mechanism in order to synthetically reproduce this material. (Barber, A. H.; Lu, D.; Pugno, N. M., Extreme strength observed in limpet teeth. Journal of The Royal Society Interface 2015, 12 (105), 20141326) As you may know, magnetite is a geologic mineral that is common and abundant in the earth’s crust. There are a few other animals that are known to produce biological magnetite: trout, fruit flies, sea turtles, and pigeons, each uses the magnetic properties of magnetite for navigation. Little is known how their biological systems make the magnetite. A better understanding of the biomineralization process combined with the mollusk tooth architecture and mechanics could help scientists in the coatings and tooling industries. In addition to these applied sciences, these mineralized nanoscale materials could be used for energy and water based applications. A professor of materials science and chemical engineering in UC Riverside’s Bourns College of Engineering published a paper that elucidates the biological process that allows the chiton to produce magnetite nanomaterials. This type of mollusk (chiton) has rows of teeth attached to a ribbon like structure. Each tooth is composed of a mineralized cusp, a pointed area, and base supporting the mineralized cusp. Magnetite is deposited in the cusp region. As the teeth wear down, they are replaced by new teeth. 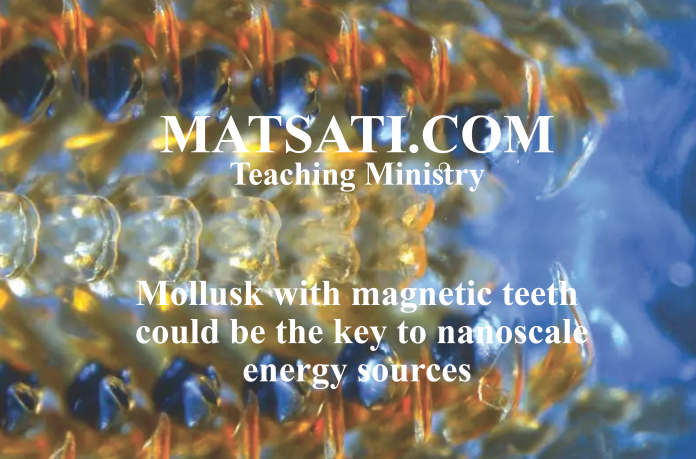 This replacement mechanism results in various stages of tooth development which allows for a closer investigation of how the mollusk is creating these magnetite teeth. The researchers looked at the transcriptome, a set of RNA molecules in the tooth to understand how the genes were expressing and forming these substances. The DNA contains the information needed to make the teeth, and the RNA is what transcribes the code in the DNA to manufacture the teeth. The Scientists discovered a protein called ferritin in the RNA transcription process. Ferritin stores iron (Fe) and then releases it in a controlled fashion. Those in the mineralized teeth include proteins of mitochondria that may provide the energy required to transform the materials into magnetite (Fe3O4). In the fully mineralized teeth, researchers identified 22 proteins and a new protein that that functions as a “radular tooth matrix protein.” The new protein interacts with other substances in the teeth to produce the iron oxide magnetite (Fe3O4). Researchers say this could help scientists solve an urgent problem for next generation electronics, nanoscale energy sources for power conversion systems in the applied sciences. Knowing how to control the growth of biological magnetite which is magnetic, there are also electrical applications that could help scientists produce nanoscale energy or communication materials. Learning to utilize this biological process has far reaching practical applications. What might be the Spiritual applications for this kind of research? Here the rabbis recognize the difficulty of removing idolatry, as Ezekiel 14 states, each man sets up an idol in his heart. This is how we are to understand the Talmudic conclusion of the Lord removing all idolatry from the world would result in cutting off mankind from the face of the earth. What we are learning from the interpretation of these things is that we find a parallel in the research on the biological processes of metallic teeth. In the applied sciences, we know the chemical composition, raw materials, etc., but we do not understand how all of these things come together in the sense of its biological mechanism. In the deliverance of God’s people from Egypt, Moshe delivered a mixed multitude. Here in the text, we are given Israel’s composition, this parallels the 70 nations that went down into Egypt, and the rabbinic interpretation of how all of the Torah was given to all of the nations, and only one nation, Israel, accepted God’s instructions. The people need to learn how to walk and live according to God’s will. They grew up not in a godless world, but in a world filled with many kinds of gods and man-gods (i.e. Pharaoh). We on the other hand have grown up in a godless world (atheism) and a sinful world. Like this mixed multitude, we are set in our own ways, and in darkness, we would not know the difference between right and wrong unless we were to have the light of God’s Word (the truth of God’s Torah / His Instruction). Like the researcher who spends a lifetime working on various projects to learn and understand as in this example the chiton (God’s creation); it also takes us a lifetime studying, applying, and believing (having faith) in order to understand what it means to be a child of God and to live in God’s ways. This reveals to us how our faith takes effort on our part to know our Father in heaven and His Messiah Yeshua. This breaks down the faith alone doctrines that are being taught today! Moshe functioned as a mediator between the people and the Lord God Almighty. He went up to Sinai and pleaded with God to have mercy, and if He would not have mercy (if He would not forgive) Moshe requested that he also would be blotted out of the book of life. The Lord God responded saying it is the sinner who will bear the punishment for his sins. The Torah writes וַיְחַל מֹשֶׁה אֶת-פְּנֵי יְהוָֹה אֱלֹהָיו, “Moses pleaded before Hashem, his God.” Moses pleaded and the Lord had mercy. We also learn in the Apostolic Writings, Yeshua functioned in a similar way and pleads with our Father in heaven for the forgiveness of our sins. Yeshua pleads with the attribute of Justice by reason of his own blood that was shed on our behalf. Yeshua laid down his life, as Moshe was laying down his for the children of God in the wilderness. Even after having seen such a tremendous sin Moshe approached God and offered up himself in their place. This is exactly what is taking place today by faith in Yeshua God’s Messiah. It does not matter the magnitude of the sin, we are to repent (perform Teshuvah), turn from sin, and seek the Lord God Almighty for His forgiveness in Yeshua’s name.